This week Oceania Swimming celebrates the UN’s International Volunteer Day, celebrating volunteers all around us who come to our assistance in times of need, help save lives and support people so that they can live their lives in dignity. Around the pools and beaches of Nadi and Suva, children are splashing and playing in the water with Fiji Swimming Development Officers in their weekly Let’s Swim program, a grassroots swimming for social development program funded under the Pacific Sports Partnership program by the Australian Government. Thousands of children have gone through the program thanks to the efforts of the program. Behind the scenes, sitting in the Fiji Swimming office is a small team making sure that everything is in place so Development Officers can focus on delivering fun and educational programs. Diane Gregory is the latest member to the team, who joined the Australian Volunteers program, an initiative of the Australian Government. 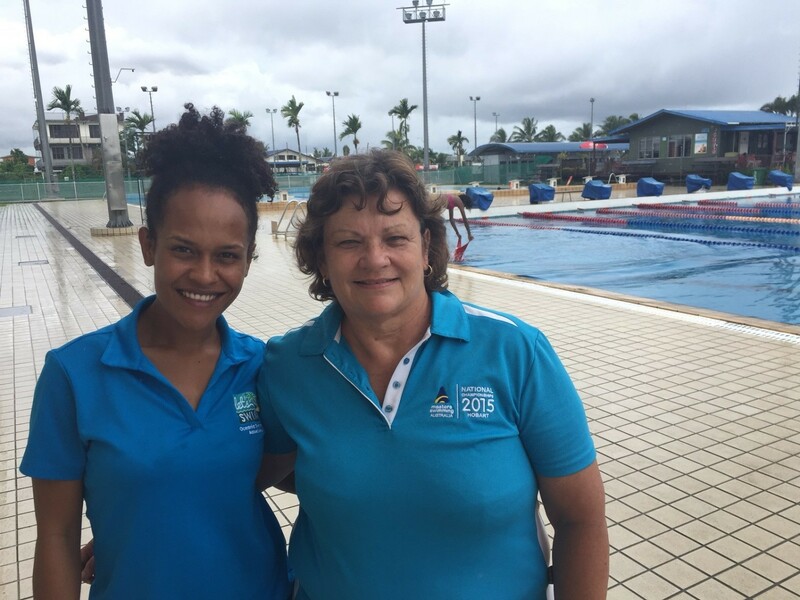 She is the fourth Australian volunteer to join the Oceania swimming family in the past two years. Diane has a very specific task that some might not think of when they hear about a “swimming volunteer”. Her role has consisted of financial policy development for the organisation and streamlining accounting processes. In small organisations such as many sporting Federations across the Pacific, having a strong financial management system means that the very few dedicated staff can focus on the sport side of programs. It takes a unique person to put their hand up to volunteer. Diane’s previous work setting up financial systems in NGOs took her around the world and motivated her to pursue this volunteer role. It takes an even more unique volunteer to do it again – Diane was a volunteer in Cambodia for two years prior coming to Fiji. Fiji Swimming is one of the bigger federations across the Pacific. With 10 swim clubs in the country running multiple events at their Olympic pools and sending swimmers to compete around the world. Needless to say; Diane and the Fiji Swimming staff have been very busy over the last few months. As internal systems strengthen, staff can expand their efforts. Word has spread around Fiji about the Let’s Swim program which has led more communities to request the program come to their school. She has left a long lasting impact on the organisation. "Diane has left a huge footprint that would be hard to fill. She has helped put financial operating systems in place. Because of her I now know what I am doing and most importantly why I am doing it. She has given me a sense of direction when it come to finance," said Lydia Sogotubu, Diane's counterpart. Diane came into this role with a good understanding of what it takes to be a volunteer; with some days being easier than others. “You have a limited time to understand the organisation and it’s needs and then work out the best way you can help. You are invariably working in an environment where priorities and values are different to what you are used to and you have to give yourself time to understand that new environment while being conscious of achieving the assignment goals. Having said that that can also be what makes the assignments interesting because you do have to challenge your own values. My advice would be to embrace the whole experience and don’t put too much pressure on yourself, things will never be as you expected so just enjoy the ride,” says Diane. Oceania Swimming has 15 member federations across the Pacific and continues to partner with Australian volunteers to build up local programs. What a better way to spend your day than helping grow a sport in the region while helping families and children become safer in the water.